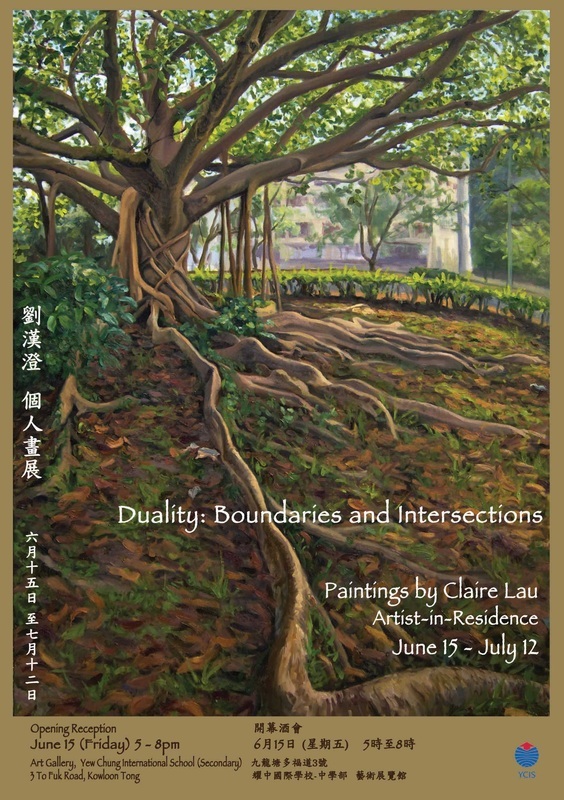 Duality is an exhibition of paintings made on and through the observation of two opposite sides of the earth: the Pioneer Valley (Massachusetts, USA) and Hong Kong. These works explore the physical and spatial relationship between humans and nature; they juxtapose the urban with the wild, the traditional with the modern, and the rooted with the mobile. Claire insists on painting plein-air*, during which she interacts and builds a relationship directly with her surroundings. As a young artist living in the 21st Century, she sees this process as a crucial response to today’s digital age, where one’s regard is always fixated on a screen. Obstinately painting outdoors in the winter of Massachusetts and the summer of Hong Kong, she strives to compel today’s over-stimulated eyes to pause and ponder on their surroundings. Having divided her life between France, Hong Kong and the U.S., Claire has been intrigued by the interplay between human activity and nature in her various environments. Claire’s paintings from the U.S. feature everyday forgotten sites that carry the human imprint on nature. These range from abandoned vehicles in the forest to tire tracks on the ground to piles of cut wood. After returning to Hong Kong last year, she began to explore the dialogue between nature and the urban environment – their proximity, their wrestle for space, yet their ability to co-exist. In the panoramic views from the New Territories, one can easily discern a generous mix of forested hills, construction sites, modern skyscrapers, temples and villages. Parallel to this, she is developing a series of paintings on mountain figs and banyan trees, often found to grow on roadsides throughout the city. She is intrigued by how these seemingly spiritual beings create ecosystems amongst the surrounding concrete, while also inadvertently forming architectural spaces in an organic manner. They create a unique spatial relationship as the human enters the domain of these living structures. Claire’s work is a confrontation to our detachment from the world around us. She investigates the dynamic between human activity and nature by painting within it. * Plein-air painting is the practice of painting "in the open air", or outdoors, made popular in France by the Barbizon painting school in the mid-19th Century. Claire Lau is an Artist-in-Residence at Yew Chung Education Foundation.